Submitted by Taps Coogan on the 20th of July 2017 to The Sounding Line. Seven months into the OPEC oil production cut agreement, West Texas Intermediate crude oil (WTI) remains below $50 a barrel, essentially the same price as when the OPEC deal was announced in December 2016. Despite initial optimism that the deal would reduce record global excess oil supplies, even the extension of the deal for an additional nine months has failed to significantly balance oil markets and raise prices. Yet, it is not for a lack of implementation of the deal. As the chart below shows, the 11 OPEC members who agreed to production caps (Angola, Algeria, Ecuador, Gabon, Iran, Iraq, Kuwait, Qatar, Saudi Arabia, the UAE, and Venezuela) have largely complied with the more than one million barrels a day in oil production cuts imposed on them. While these cuts were made from record 2016 production levels, they have nonetheless succeeded, so far in 2017, in bringing down production to below 2016 levels. So why haven’t oil prices risen? 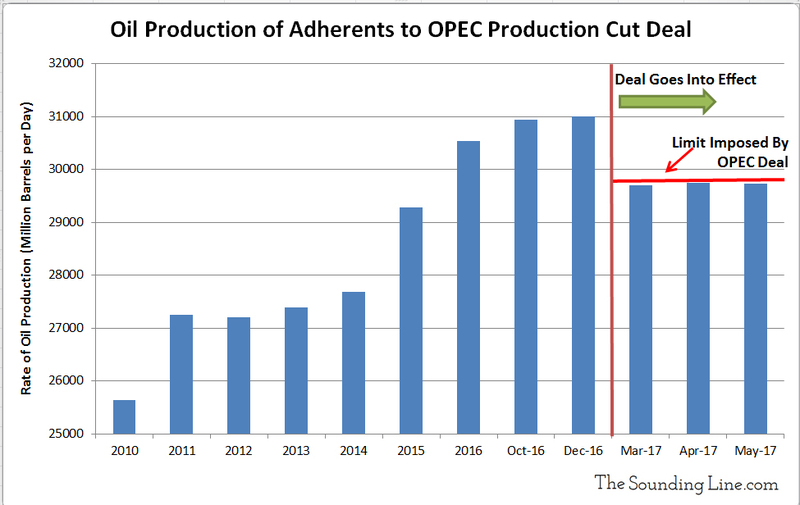 These production cuts have been undermined by surging production by the two OPEC members who are not adherents to the deal (Libya and Nigeria), who together have added over 460,000 barrels per day of production compared to 2016. This has made the just over one million barrel per day of claimed OPEC cuts really just a 640,000 barrel per day once accounting for Libya and Nigeria. To make matters worse, oil production outside OPEC has been rising, with the US alone having added over 660,000 barrels per day of oil production so far in 2017. The net effect of this is that the OPEC oil production cuts have been offset by increased production in Libya, Nigeria, and the US. As a cartel, OPEC exists largely to support oil prices. The failure of this deal is not in its implementation but in its effect, and as such, this deal raises the question of whether OPEC itself has become obsolete. OPEC only produces about 40% of the world’s oil, and with significant excess capacity in many non-OPEC countries, OPEC appears no longer to be able to meaningfully support prices through conventional actions. To add insult to injury, Ecuador, an OPEC adherent to the production cuts, has announced they are now giving up on their obligations under the deal as their budget crisis worsens. With Saudi Arabia, by far OPEC’s largest producer, running a budget deficit nearly 17% of its GDP, if oil prices don’t rise soon, Saudi Arabia may be forced to do the same or contemplate ‘unconventional’ options, which could further undermine OPEC and regional stability.